Huge Savings Item! Save 13% on the HERY8448YER01 - 48 GAL BIO TUF CAN LINERLT. GREEN 100/CASE by Heritage Products at Halo Grow Box. MPN: Y8448YER01. Hurry! Limited time offer. Offer valid only while supplies last. 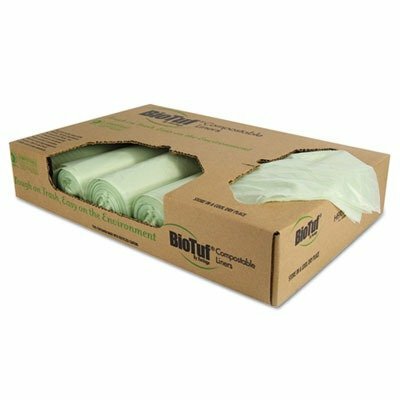 Choose sturdy, compostable can liners with excellent tear and puncture resistance. Optimal lifting strength and load capacity won't let you down. View More In Lawn & Leaf Bags. Choose sturdy, compostable can liners with excellent tear and puncture resistance. Optimal lifting strength and load capacity won't let you down. These durable bags stand up to the toughest trash for an excellent value. Application: Can Liner Capacity Range Volume: 48 gal Thickness: 1 mil Materials: Bioplast. If you have any questions about this product by Heritage Products, contact us by completing and submitting the form below. If you are looking for a specif part number, please include it with your message.